BIG SALE!! 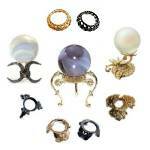 GEMSTONE DECOR COLLECTION BIG SALE!! Shimmering Selenite Skyscraper Towers from Morocco make wonderful night lights when placed over any LED light base. 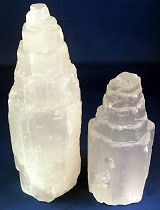 Selenite grows in long "cat's eye" colorless translucent pearl white crystals. It is said to be a powerful cleanser of negative energies, even clearing quartz crystals. These flat bottomed Selenite Towers come in two sizes with a white LED Light Base included. LED White Light Base Included. Brazilian Agate Geodes are sliced and polished to create a natural candle holder that shows off the beauty of both the rough and polished stone. Natural Agate candle holder has a smooth drilled hole 1 1/2" W for a tea light candle. The base has a felt lining. Each piece is a unique size and weighs 11ozs to 1lb 5ozs or more. Brazilian Agate Geodes are sliced and polished to create a natural candle holder that shows off the beauty of both the rough and polished stone. Pink Dyed Agate candle holder has a smooth drilled hole 1 1/2" W for a tea light candle. The base has a felt lining. Each piece is a unique size and weighs 11ozs or more. Brazilian Agate Geodes are sliced and polished to create a natural candle holder that shows off the beauty of both the rough and polished stone. Natural Gold Agate candle holder has a smooth drilled hole 1 1/2" W for a tea light candle. The base has a felt lining. Each piece is a unique size and weighs 11ozs to 1lb 5ozs or more. Brazilian Agate Geodes are sliced and polished to create a natural candle holder that shows off the beauty of both the rough and polished stone. Purple Dyed Agate candle holder has a smooth drilled hole 1 1/2" W for a tea light candle. The base has a felt lining. Each piece is a unique size and weighs 11ozs to 1lb 5ozs or more. 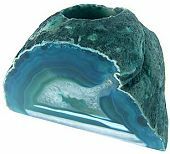 Brazilian Agate Geodes are sliced and polished to create a natural candle holder that shows off the beauty of both the rough and polished stone. Green Dyed Agate candle holder has a smooth drilled hole 1 1/2" W for a tea light candle. The base has a felt lining. Each piece is a unique size and weighs 11ozs to 1lb 5ozs or more. Rough cut Brazilian Rose Quartz Crystal candle holder with a smooth drilled hole 1 5/8" W for a candle or tea light provides exotic soft glow. The base has a felt lining so this accessory can be used without fear of scuffing. Each piece is a unique size and weighs 1 1/2lbs or more. Rough cut Brazilian Aventurine Crystal candle holder with a smooth drilled hole 1 5/8" W for a candle or tea light provides exotic soft glow. The base has a felt lining so this accessory can be used without fear of scuffing. Each piece is a unique size and weighs 1 1/2lbs or more. Rough cut Brazilian Quartz Crystal candle holder with a smooth drilled hole 1 5/8" W for a candle or tea light provides exotic soft glow. The base has a felt lining so this accessory can be used without fear of scuffing. Each piece is a unique size and weighs 1 1/2lbs or more. Brazilian Agate Geodes are sliced and polished vertically to create a natural candle lamp or votive that let's the candle light glow through the polished translucent agate face. Pink Dyed Agate candle lamp has a smooth drilled hole 1 1/2" W x 3" D for a tea light candle. The base has a felt lining. Each piece is a unique size and weighs 1lbs 4ozs or more. Brazilian Agate Geodes are sliced and polished vertically to create a natural candle lamp or votive that let's the candle light glow through the polished translucent agate face. Blue Dyed Agate candle lamp has a smooth drilled hole 1 1/2" W x 3" D for a tea light candle. The base has a felt lining. Each piece is a unique size and weighs 1lbs 4ozs or more. Brazilian Agate Geodes are sliced and polished vertically to create a natural candle lamp or votive that let's the candle light glow through the polished translucent agate face. Purple Dyed Agate candle lamp has a smooth drilled hole 1 1/2" W x 3" D for a tea light candle. The base has a felt lining. Each piece is a unique size and weighs 1lb 10ozs or more. Brazilian Agate Geodes are sliced and polished vertically to create a natural candle lamp or votive that let's the candle light glow through the polished translucent agate face. 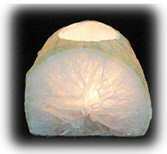 Natural Agate candle lamp has a smooth drilled hole 1 1/2" W x 3" D for a tea light candle. The base has a felt lining. Each piece is a unique size and weighs 1lb 4ozs or more. 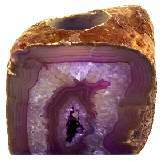 Brazilian Agate Geodes are sliced and polished vertically to create a natural candle lamp or votive that let's the candle light glow through the polished translucent agate face. Teal Dyed Agate candle lamp has a smooth drilled hole 1 1/2" W x 3" D for a tea light candle. The base has a felt lining. Each piece is a unique size and weighs 1lbs 4ozs or more. Beautiful Clear Quartz thick slab votive or candle holder from Brazil, has rough cut sides and a smooth polished top with a drilled hole 1 5/8" W for a candle or tea light. It provides a soft gem glow for your enjoyment. The base has a felt lining and each piece is a unique shape weighing 1lb 10ozs or more. Gorgeous Yellow Calcite thick slab votive or candle holder from Mexico, has rough cut sides and a smooth polished top with a drilled hole 1 5/8" W for a candle or tea light. It provides a soft gem glow for your enjoyment. The base has a felt lining and each piece is a unique shape weighing 1lb 10ozs or more. Brilliant Orange Calcite thick slab votive or candle holder from Madagascar, has rough cut sides and a smooth polished top with a drilled hole 1 5/8" W for a candle or tea light. It provides a soft gem glow for your enjoyment. The base has a felt lining and each piece is a unique shape weighing 1lb 11ozs or more. Deep Green Quartz thick slab votive or candle holder from Brazil, has rough cut sides and a smooth polished top with a drilled hole 1 5/8" W for a candle or tea light. It provides a soft gem glow for your enjoyment. The base has a felt lining and each piece is a unique shape weighing 1lb 10ozs or more. Brazilian Agate Geodes are sliced and polished to create a natural candle holder that shows off the beauty of both the rough and polished stone. Blue Dyed Agate candle holder has a smooth drilled hole 1 1/2" W for a tea light candle. The base has a felt lining. Each piece is a unique size and weighs 11ozs or more. Brazilian Agate Geodes are sliced and polished to create a natural candle holder that shows off the beauty of both the rough and polished stone. Red Dyed Agate candle holder has a smooth drilled hole 1 1/2" W for a tea light candle. The base has a felt lining. Each piece is a unique size and weighs 11ozs or more. Rough cut Brazilian Sodalite candle holder with a smooth drilled hole 1 5/8" W for a candle or tea light provides exotic soft glow. The base has a felt lining so this accessory can be used without fear of scuffing. Each piece is a unique size and weighs 1 1/2lbs or more.